Roger Olson has just completed an interesting series Was Kierkegaard an evangelical? – part 1, part 2, part 3. In fact by the final part of the series he has dropped the question mark and changed the title to “Kierkegaard as evangelical”. 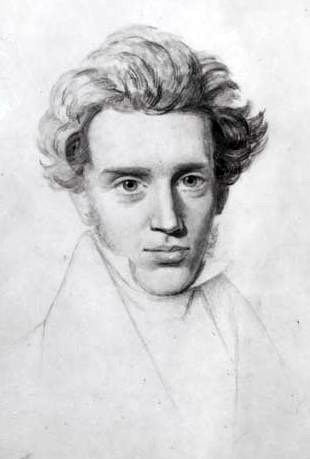 The 19th century Danish philosopher, theologian and religious author Søren Kierkegaard has certainly been a controversial figure among evangelical Christians. As Olson notes in his part 2, influential evangelicals such as Francis Schaeffer and John MacArthur have denounced Kierkegaard as “a pernicious influence” and “Adrift on a sea of subjectivity” – apparently on the basis of very limited acquaintance with his works. K. wrote much about the church and most of it was negative. That was not because he disdained church but because the only church he knew (in his context) was the Danish Lutheran (state) Church. … But the point is that K. did NOT reject church in favor of a totally atomistic understanding of Christianity. What he rejected was Christendom–the church as synthesized with society such that belonging to the society made one a Christian and vice versa. It seems to me that in many ways Kierkegaard, as presented by Olson, was a very modern, or even postmodern, Christian. He took the Bible as authoritative, but was wary of the traditional teachings of the church. Perhaps he should have been born in the late 20th century instead of the early 19th. If he had been, he might have got on well with Rob Bell. But then perhaps today’s Christianity would not have been the same thing if Kierkegaard had not been one of the first to challenge the over-intellectual tradition in theology which is still so strong among “Reformed” Evangelicals. I can’t help thinking that Kurt Willems might consider Kierkegaard to be an evangelical reject. He has certainly been rejected as evangelical by people like Schaeffer and MacArthur. But, for the same reasons that I wrote in response to Willems I’m an Evangelical – don’t let them steal the name, I agree with Olson that we should accept Kierkegaard, posthumously, as a brother Evangelical. Meanwhile I still don’t know if the story Flying like wild ducks which I posted here last year is genuinely by Kierkegaard. If anyone reading this can enlighten me about that, please comment on that post. This entry was posted in Evangelicalism, History, Individuals, Science and Philosophy by Peter Kirk. Bookmark the permalink. J.B.Torrance and T.F. Torrance were both exceedingly keen on Kierkegaard as his C. Stephen Evans and Murray Rae – all are Reformed. And my son, Andrew Torrance, is writing his doctorate on Kierkegaard and Barth. Thank you, Professor Torrance, and welcome to Gentle Wisdom. I am glad to hear that your distinguished family of theologians are keen on Kierkegaard, and that not all in the Reformed tradition are as negative as Schaeffer and MacArthur. Sadly the approach of those two in condemning Christian thinkers without making the effort to understand them properly has become all too characteristic of the “young, restless and Reformed” tendency, who sometimes behave more like fundamentalists. It is good to be reminded that that there is an altogether more thoughtful and scholarly Reformed tradition which is being kept alive by three generations of Torrances, and I hope elsewhere.